We launched an online service called Spiritedd in August 2009 with the tagline “inspiring drives for spirited drivers”. The basic idea was to allow driving enthusiasts to post their favourite drives online and share these with fellow spirited drivers. 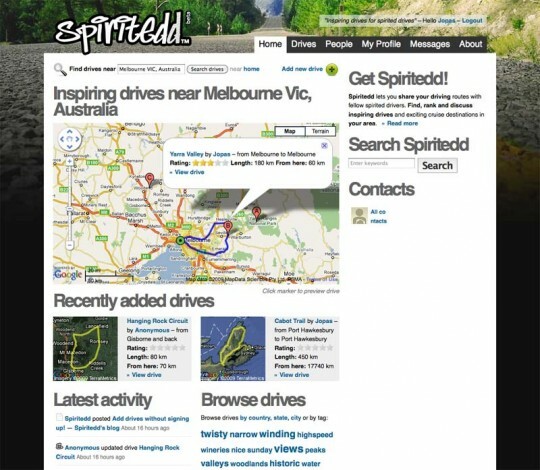 Technically, Spiritedd was a Google Maps mash-up for user-created content, merged with a social network. Here’s the original introduction. It’s interesting that you’ve had a similar experience with your service. I still believe in the idea and find it really surprising that there are no popular, well-designed map-based online services for car or bike enthusiasts to share their favourite driving or riding routes. Some history. As far as I know one of the key pioneers in this space is bikely.com for cyclists (also Melbourne-based) that was acquired by bikeradar.com and hasn’t seen much if any development since. The same technology is used to run motowhere.com for motorbike riders. Another local service is agoodride.tv that also seems to be getting only marginal use. These sites are all stuck in that circa 2008 user experience and could easily be improved. Based on my research about a year ago (late ’09 – early ’10) gpsies.com and trails.com were two leading services in map mashups, and there are probably other good ones out there these days too. 1. Wrong medium. ‘Sharing’ is the primary activity and what you’re sharing (drives/routes) is secondary. People don’t want to create an account and login to yet another website just for this one purpose. Two words: Facebook app. Better yet: integrated FB+iPhone app. 2. Lack of follow-up, related to point 1 above. On Spiritedd for example, once you found a drive and printed out the map, there was little reason to go back to the site. It would have needed a lot more social design work to build in proper ‘hooks’ to entice people to come back. 3. Lack of marketing. I think very few of the drive/ride sharing services have had proper marketing efforts behind them. I reckon partnering up (or selling out to) a big brand would give them much better chance of success. See (formerly Nokia’s) Sports Tracker and Nike Plus. 4. Fragmented enthusiast space. This is specific to the car scene at least in Oz and probably overseas as well. A lot of people have their brand loyalty blinkers on and refuse to consider anything from the rivals. If you’re into imports you sneer at V8 muscle cars and vice versa. This is problematic for a service like Spiritedd, where you’d almost have to ‘rebrand’ the service for each audience segment but still pool all content (driving routes) together and make them available for all audiences, since volumes are crucial.